Shree Kalyanika Himalaya Dev Sthanam is a spiritual vision of a Parma Yogi Kalyandasji who after attaining the state of extreme joy and bliss, returns to his fellow beings to show them the path of the real glory. As only a burning candle can light the other one, the real wisdom can only be achieved through a wise guru. As Guru-Bhakti is the foundation of all spiritual development. Shree Kalyanika Himalaya Dev Sthanam Ashram is located in Almora district of Uttarakhand state in India. In Uttarakhand, the ashram is famous as Dol Ashram because of the nearby Dol village. The ashram is situated at the middle of the dense Himalayan forest on the path of Almora with deep serene silence. It is spread over 8 acres on the dense forest hills. Spiritual temples, beautiful gardens, Gau-Shaala(Cow Shelter), Dhyana Peetham(meditation & spiritual energy core) and beautiful landscape structure make this ashram a divine, spiritual and natural aesthetic piece of architecture. Kalyanika Himalaya Dev Sthanam is also a spiritual knowledge center of Vedic knowledge, Yoga, Dhyana(Meditation), Ayurveda and Astrology. The ashram also runs a Sanskrit Gurukulam for the underprivileged family’s children. In April 2018 the Dol ashram established world’s largest Shri Yantra which weighed around 1.6 tonnes inside a Sri Yantra Dhyana Peetham. This Sri Yantra is a spiritual cosmic energy center to spread prosperity and peace. Kalyanika Dol Ashram is a spreading spiritual Vedic knowledge, traditional Indian Vedic educational values and Indian Vedic heritage and culture in the world. Tapasvi Baba Kalyandasji of Himalaya left his home at the age of twelve, visiting various religious places of India. On the bank of river Ganga, Satguru(late) Baba Swaroopdasji Maharaj, who initiated him with Udasin Sect of Religion. For more than 25 years Pujya Babaji decided not to leave under the roof during his sadhana. 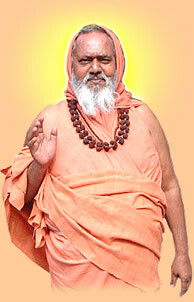 Tapasvi Baba Kalyandasji is a founder of Kalyan Seva Ashram Trust in Amarkantak (MP) India. where the holy river the Narmada is originated by God Shiva’s tapasya. The love for fellow beings compelled Pujya Babaji to come back after more than 40 years of penance and show the divine path of inner awakening to the fellow beings. By that time many people had already got attracted by the aura of the true yogi and sadhaka. In 1978 taking the path of Lord Rama and Acarya Shi Chandra to educate people and to lift the condition of their lives Babaji established Shree Kalyan Sewa Ashram in Amarkantak an ancient pilgrimage, the birthplace of the holy river Narmada, home for many tribes. During his second visit to Kailash Mansarovar, Pujya Babaji had a vision of Ma Bhagvati (Mother Goddess) and got inspired to start an Ashram in the Himalayas and Pujya Babaji established Shree Kalyanika Himalaya Dev Sthanam amid dense forest near Almora. The Ashram takes you through a spiritual voyage where one observes a life based on the principles of Yoga and Vedanta. The Ashram follows a routine which eliminates the supreme hindrance to the spiritual life i.e. laziness (alasya). The modern lifestyle has brought out many physical as well as mental problems such as restlessness, depression, obesity; anxiety etc. and these conditions can easily be altered by just changing the sedentary lifestyle which we are habituated to. The Ashram routine also inculcates the spiritual and moral values which transform the human into a superhuman. The nishkam karma yoga proposed by Lord Krishna works as an inspiration to all of the residents of the Ashram. The Ashram provides such an opportunity by conducting spiritual sessions with the eminent saints and speakers to deliver lectures on various spiritual texts such as Gita, Upanishads, Shreemad Bhagavatam, Patanjali Yoga Sutras etc. to lighten the path of seekers by prescribing the most effective style of spiritual practice. Yoga & Meditation Courses- At Ashram we carried many courses of meditation & yoga based on Vedanta, Vipassana, Patanjali philosophy. Shri Kalyanika ashram has a world biggest Sri Yantra which weighed around 1600 KG. This is first and biggest Meditation & Yoga facility built as per the philosophy of Sri Yantra which brings good health, prosperity & wisdom. The Sri Yantra is composed of astha dhatu to vibrate the cosmic energy in its surrounding. The Dhyan Peetham is specifically developed for the Yoga & Meditation for the yogis and the spiritual seekers. The Sri Yantra is a form based on the Vedic philosophy and rituals. Sri Yantra is a form or instrument associated with the Goddess of wealth and prosperity Goddess Shri or Lakshmi. Accommodation: The Ashram provides lodging and food facilities to the seekers and visitors who want to take part in the Ashram activities. The Ashram provides double bedded fully furnished rooms with hot water facility. The Ashram has an in-house mess with a capacity of 120 people. Library: Shree Chandracharya Library was established in the year 1997. The Library has a collection of over ten thousand books covering topics on spirituality and various other subjects. It not only serves the educational purpose of the students residing in the Ashram but also benefits the visitors and seekers. It has a unique collection of all the four Vedas along with the commentaries. Meditation Hall: Himalayas serene environment helps a seeker in his quest of realizing the ultimate. Keeping that in mind a meditation hall with a capacity of around 300 people was built in the year 2006 to practice the meditative technique- Dhyana Praweshika – an ancient meditative technique evolved during years of penance and sadhana by Pujya Babaji. Snow-clad Himalayan Mountain range is clearly visible from the hall which makes the experience worthwhile. For Booking Please Select the Booking Dates & Fill the Booking Form. Best ashram for peace & yoga. Sattvic food, nice & clean room, and a good library in the ashram. Outstanding and soulful experience in the kalyanika himalayan ashram, serene beauty of himalayan forrest, spiritual temple, sri yantra temple is spiritual energy core I have felt a divine power of cosmic energy during the meditation in it. I will recommend to all to visit this ashram if you are Planning for spiritual himalyan journey . Must visit. Kalyanika Himalayan ashram is one of the beautiful spiritual ashrams on the Himalayas in India, beautiful natural forest, hills, people, and spirituality are the best part of kalyanika Himalayan ashram. The stay in the ashram is very peaceful and relaxing. Ashram rooms are neat & clean and affordable. This is the best place to spend the holidays to gain spirituality and wisdom from the Babaji Kalyandasji. Must recommend to everyone. Very beautiful ashram, nice temples, and a garden. Sri yantra temple is very big and beautiful. Must visit place. The stay in Kalyanika Ashram Dol is quiet and calming. The location of the ashram is very beautiful and serene, surrounded by the dense Himalayan forest and hills. The environment of the ashram is spiritual and pure. Must visit ashram in India.